Not everyone is a candidate for whitening or even implants. So you may be wondering if there are any other options to improve your smile. Veneers and bonding have come a long way in recent years and could be a great option for you or your loved one. Veneers are thin pieces of porcelain or plastic that are glued to the front of the teeth. They create an aesthetically pleasing and durable smile for teeth that are stained or misshapen. Veneers are difficult to stain, making them popular for people seeking a perfect smile. With veneers, you should avoid biting your nails, opening nuts with your teeth, and chewing on pens, ice or other hard objects. Porcelain (indirect) veneers must first be created to fit your teeth in a dental laboratory and last from 10 to 15 years. Porcelain veneers have a translucent quality and look more like natural teeth than composite veneers. Composite (direct) veneers are comprised of enamel bonded to your tooth in a single office visit. Composite veneers last five to seven years and are slightly cheaper than porcelain veneers. Bonding uses composite resin to restore chipped or broken teeth. Bonding can also fill in gaps and reshape or recolor your smile. After applying a very mild etching solution that slightly roughs the surface of the teeth and permits the bonding material to adhere, your dentist applies the resin and sculpts, colors and shapes it to provide a pleasing result. A high-intensity light hardens the material, which is then finely polished. Many people choose bonding over silver fillings because it looks more natural and the material can be matched to your natural tooth color. Unlike veneers, coffee, tea, wine and smoking can stain the material used in dental bonding, particularly in the days following the procedure. And, dental bonding isn’t meant to make over an entire smile. Bonding is best for minor imperfections and repairs, such as chips and slightly misshapen teeth. If you are interested in learning more about veneers or bonding call 844-365-DENTAL to reach the Dental365 location nearest you. 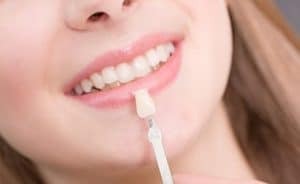 One of our amazing cosmetic dentists can tell you if you are a good candidate for veneers or bonding and answer any questions you may have.